This beautiful Frankincense Essential Oil comes from a small tree (Boswellia Carteri) native to North Africa and some of the Arab countries. When the bark is damaged the tree exudes a resin in drops, or 'tears' and the essential oil is extracted from the resin by steam distillation. In past times the resin was collected from trees in which cracks had appeared naturally, but later cuts were made in the bark systematically to encourage resin production. The oil varies from colorless to very pale yellow, with a clear, fresh, slightly camphorous penetrating odour. Among the chemical constituents who make up this oil are 1-pinene, dipentene, phellandrene, camphene, olibanol and various resins. Frankincense, in the form of the resin, has been burnt on altars and in temples since earliest antiquity. This use probably goes back for further than the earliest written records, and is perpetuated in the current practice of many religions. I find it fascinating to reflect on the fact that Frankincense has, among its physical properties, the ability to slow down and deepen the breath, and to breathe more slowly and deeply soon produces feelings of calm, which are very conducive to prayer and meditation. At what stage in the history of the use of Frankincense did our forebears discover this? Almost certainly, the origin of its use as an offering lay in the fact that Frankincense was among the most prized and costly substances in the ancient world. Both the Hebrews and the Egyptians spent vast amounts of money importing Frankincense from the Phoenicians. Frankincense is also beneficial for various skin conditions. It is mild enough to be applied without dilution, in most instances. It can be used for dermatitis, acne and other skin conditions, as well as to reduce wrinkles or scarring from cuts and wounds. 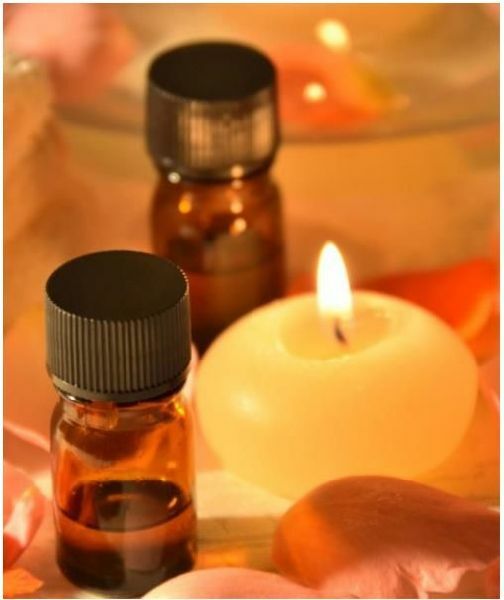 Uses : The frankincense essential oil is widely known for its therapeutic properties. It is also used as an antiseptic, astringent, carminative, digestive, diuretic, sedative and as a tonic. Blends With : This oil blends with Basil, Bergamot, Cardamom, Cedarwood, Chamomile, Cinnamon, Clary Sage, Coriander, Geranium, Ginger, Myrrh and Vanilla. Constituents : It contains alpha-pinene, alpha-thujene and octanol, Ketonic alcohol (olibanol), resinous matters (30 - 60 per cent) and terpenes (camphene, dipentene, a- and p-pinene, phellandrene).